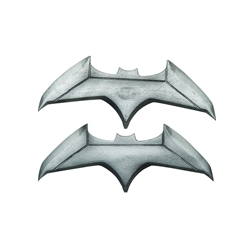 The Batman Batarangs are a pair of Silver Batarang prop weapons as pictured. Gear up to defend Gotham with the Batman Batarangs! This iconic weapon is a great addition to any Batman Halloween costume. Check out our array of Batman accessories including Utility Belts and Grappling Hooks. Become the hero we need this Halloween!